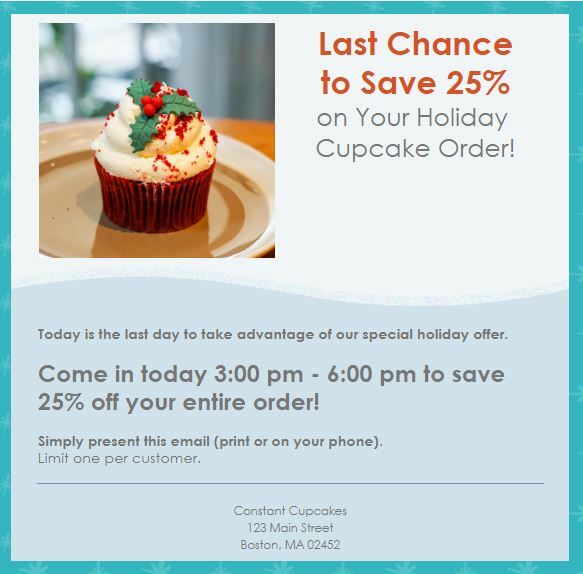 ﻿ Holiday Email Marketing: How to Save Time, Reduce Stress, and Still Get Great Results » Red Mango Marketing! You want more time to do all the things you need to do to make this holiday season a success. You want to avoid the stress of unexpected setbacks and other challenges that come with coordinating your holiday plans. You want to fill your store and get people to act on your holiday offers. With so much riding on the next few months, you may feel like achieving all three would take a holiday miracle. 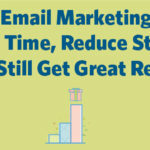 But when it comes to your email marketing, taking control of your busy schedule and getting the results you’re looking for is actually a lot simpler than you might expect. Need help with your holiday emails? Check out our webinar: Last-Minute Holiday Email Ideas! The secret to a great holiday offer is to create something that is compelling enough to get people to act. It also needs to bridge the gap between your customers’ needs and your success. For some small businesses, the offer could be a special discount or a holiday giveaway. For others, it may be a special event like an annual holiday sale or a special service, like free shipping or complimentary wrapping for your most loyal customers. Start by creating a calendar. Don’t wait! 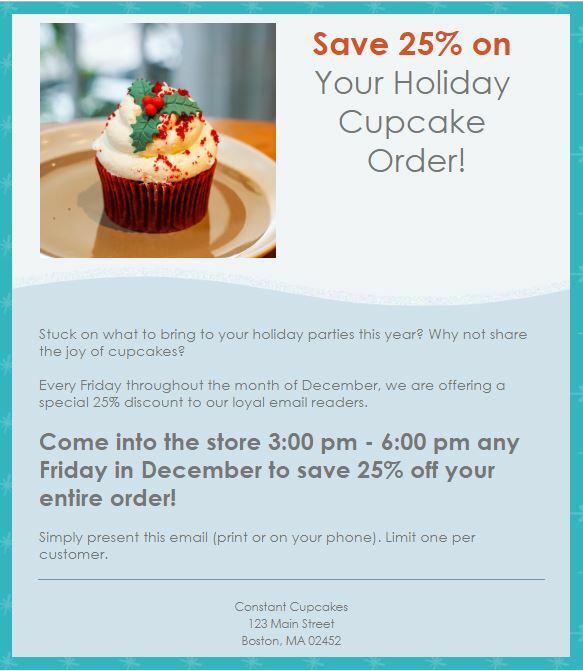 Take advantage of the time you have now, before your store is full of holiday shoppers and your phone is ringing off the hook, to start planning and creating your holiday emails. Planning ahead is one of the easiest ways to save time and reduce stress during the holiday season. Remember: The holiday season isn’t just a busy time of year for you. It’s is a busy time of year for your customers too. Keep your emails clear, concise, and to the point. Be careful not to add to the noise by overloading them with salesy holiday emails. Email 1: Announce your holiday offer. Let your customers know about your offer and why they should act on it. Email 2: Send a reminder. This is it. Your holiday offer is almost up. Let your contacts know this is their last chance to take advantage of it. 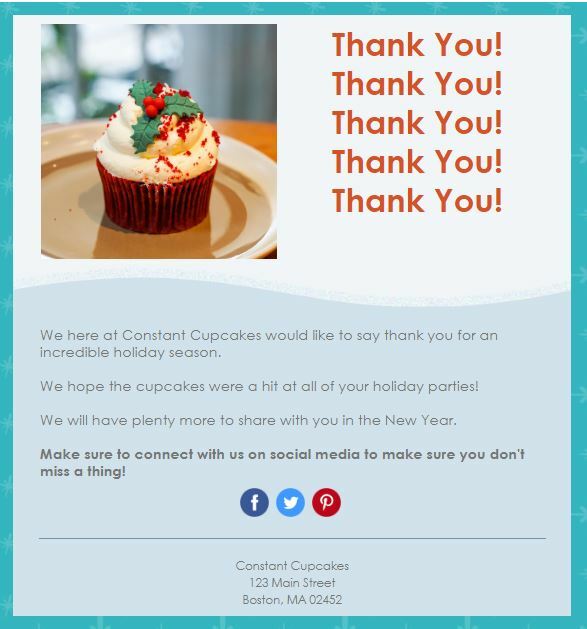 Email 3: Send a “thank you” email to your customers. It’s time to say thanks to everyone who came out to shop with you this holiday season. Expressing your gratitude goes a long way when it comes to creating long-lasting customer relationships. Email 1 (1-2 weeks out): This is when people will start planning for their big shopping weekend. Email 2 (Send the week of): Remind people about the offer, tell them to act now. Email 3 (A week after): Thank people for shopping. You could also consider sending an additional offer for all your last-minute shoppers. Email 1: Send out the offer that lets people know when it expires and why they should act now. Email 2: Send out the reminder within the last 48 hours. Email 3: Say thanks and encourage people to connect with you on Facebook/Twitter for other holiday offers/updates. With your emails designed and ready to send, you can scratch one of your biggest marketing responsibilities off your holiday to-do list. Set deadlines for yourself over the next few weeks. It may seem like an ambitious goal, but when you consider the benefits of getting it done, you’ll have all the inspiration you need to get going. The post Holiday Email Marketing: How to Save Time, Reduce Stress, and Still Get Great Results appeared first on Constant Contact Blogs. This entry was posted on Tuesday, December 11th, 2018 at 8:00 am	and is filed under Email Marketing, News & Updates, Online Marketing. You can follow any responses to this entry through the RSS 2.0 feed. Both comments and pings are currently closed.